In the print industry, die cutting is a process performed by a specialized machine to produce unique cutout shapes. Creative designs are turned into eye-catching cutout boxes, stickers, and many other items that highlight your product and promote your brand. 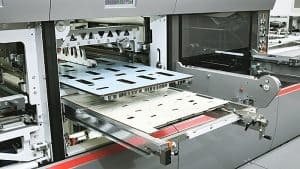 This automated process enables OlymPak to produce large quantities of unique die cut packaging and promotional products at an affordable price. 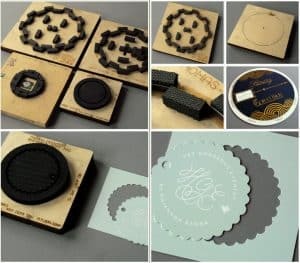 We take your design and create a specialized die cut product that meets exact specifications and results in a product that makes your brand immediately identifiable. Die cutting can be used for many things. At OlymPak, our most frequent requests are for box cutting, stickers, stand-up cards, and other promotional items. We take your design and turn it into a unique cutout shape that gives your product visual appeal that gets noticed on the shelf, rack, or anywhere it is displayed. No die cut project is too large or too small! Think of a die cutter as a cookie cutter. The shape of the die is the exact shape that gets cut into the substrate. Simply put, it is a metal tool with a raised sharp edge for cutting. Dies come in a few different forms, including thin metal dies and steel-rule dies. Steel rule dies are typically more durable and can cut thicker materials. At OlymPak we use many different types of dies that come in a wide variety of shapes, sizes, and styles. Each die is carefully selected or custom designed to meet individual project needs. What Die Cutting Machines Does OlymPak Use?